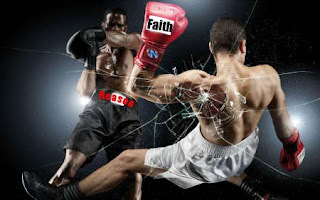 Sometimes (or many times) believers will often see a tension between faith and reason which goes way back since the inception of Christianity by Constantine (or much earlier). Usually you have those who are of extreme fideism (fideism is a theological stance that faith is either superior to reason or reason should not be applied in matters of faith) to those who are more rationalist. The Medieval theologians and the philosophers of the enlightenment relied very much on reason, while giving faith its place, in discussing about theological matters from the existence of God to the coherence of scripture. Philosophers such as Rene Descartes and Leibniz were devout believers of Christianity, but they were often criticized by their Christian contemporary because the contemporaries were suspicious of them for practicing their philosophy independently from theology and Aristotelian philosophy. During the late medieval ages, Martin Luther criticizes reason as a “a whore” and a “bride of the devil”. So there certainly was a historical reason why the tension between faith and reason continues to persists. But as usual, most believers in the wide spectrum of things would lean more towards faith than reason, and very few of them (i.e. intellectuals, scientists, philosophers, and sophisticated theologians) would try to reconcile both of them to remain in the middle. Most believers are fideists who believe that religious beliefs are mostly a matter of faith rather than also a matter of reason. Many of the believers are even willing enough to completely denounce reason as having no value in life. In this sense, many believers are anti-intellectual since they see the role of reason in their life as either devalued or trivial. There is one important clarification to consider: Fideist may not have to be extreme anti-intellectuals as some are but rather they strongly believe that certain beliefs should not require reason. It is possible for someone to be very fideistic about his or her religious faith but still be an engineer who uses intellectual abilities to learn how to build bridges. Such a person would make sure that the model is accurate, effective, and safe by re-examining them but at the same time the person would not apply such critical thinking on religious beliefs since he or she consciously believes that those beliefs are exempted from rational examination. While many believers believe that their beliefs are exempted from reason I will make the argument that this cannot be the case: such exemption will have absurd implication that would actually be detrimental to their faith. I will argue that you need reason in order to have religious beliefs. That’s right, you heard me right: I said you need reason in order to have any religious beliefs, otherwise they become incoherent. Before you jump in, just hear me out. I will make an argument that no religious beliefs (and any belief for that matter) are possible without reason. After I make this argument, I will consider objections to my argument and reply to those objections the best I can. For the sake of the argument let’s grant the premise to the religious believers that “Reason has no place in the matter of faith”. What this means is that religious belief is exempted from reason on the grounds that we should just believe in them. What I want to point out is that exempting religious beliefs from reason makes believing in them impossible. This point would be made more clearer when I point out the consequences of granting the believers the premise that “Reason has no place in the matters of faith”. When believers say that beliefs are exempted from reason since it should only be believed in, they tend to think that reason is loosely equivalent to finding evidence or justification. What they fail to realize is that while finding justification for the beliefs is certainly one of the normative functions of reason it is not the only thing that defines reason. One thing that tend to forget is formal Logic. When people use the term “Logic” they usually associate with “something that is reasonable” or “something that is true”, but there is another meaning to Logic that people tend to forget. In philosophy, Logic is the study of argumentation that consists of statements or propositions that form an inferential argument of premises and conclusions, which includes both deductive and inductive argumentation. Like any rigorous discipline, Logic has their rule that makes sense to almost everyone of us; these rules are about how propositions work. What I am trying to say here is that Logic in this sense also constitutes Reason in the most fundamental manner. Without it everything else we do with Reason is almost impossible. Without reason it is impossible to believe in anything in the usual manner; you cannot have any beliefs whatsoever. There are some basic principles of Logic that I want to go through: Laws of Non-Contradiction, Laws of Excluded Middle, and Descriptive Propositions are either true or false (this last one isn’t a “law” of logic, but it is ubiquitous in logic). Laws of Non-Contradictions are a law that says that two opposite propositions cannot both be true. The proposition “A exists” and “A does not exist” cannot both be true at the same time. For example, to say “weapons of mass destruction exist in Iraq” and “a weapon of mass destruction does not exist in Iraq” are both true is a contradiction. While the law of non-contradiction talks about how two opposite statements cannot both be true, the law of excluded middle says that a single proposition cannot be both true and false. A proposition is either true or false, but not both. To say “John Moore exists” is both true and false is a contradiction. The difference between non-contradiction and excluded middle is that the former talks about two propositions that contradict each other, while the latter talks about one proposition that cannot be both true and false, but has to be either true or false. Finally, that descriptive propositions can be true or false is another very important feature of Logic. Logic assumes that not only are all propositions are either true or false, but there is such thing as “true” and “false”. It assumes a basic vocabulary of “true” and “false” that is ubiquitous in every proposition. Without these vocabularies neither the laws of excluded middle nor non-contradiction would make any sense. First, remember that law of non-contradiction says that two opposite propositions cannot both be true, otherwise they contradict each other. Well, if the laws of non-contradiction have no place in the matter of faith then what stops believers from saying “God exists” and “God does not exist” are both true? If the laws of non-contradiction, which says two contrary propositions cannot both be true, has no place in faith then it follows that in the matters of faith it is possible to affirm two contrary propositions are both true. But this is ridiculous even to the believers. Second, the law of excluded middle says that a single proposition cannot be both true and false. Well, if that also does not have place in the matters of faith then it follows that the proposition “God exists” can both be true and false. There is nothing that logically prevents this from happening if logic has no place in the matters of faith. Another proposition “Jesus died for our sins” could also be both true and false, which is considered blasphemous to believers. Not only is it blasphemous but also incoherent. Third, the fact that there is the vocabulary of “true” and “false” are very important and basic properties that you need to attach to propositions to determine whether you believe in it or not. If you say that “God exist” is a true proposition, it follows that you believe in it. If you say “God exist” is a false proposition, it follows that you do not believe in it. How you use these basic vocabularies of logic determines what you do believe or do not believe. But if the vocabulary of reason has no place in the matter of faith then it follows that you do not either believe or no believe in anything. The proposition “God exists” is just a proposition that is neither true nor false, it’s just a rhetorical statement without any truth-value. You cannot say that you believe in the proposition “God exists” without using the vocabulary of reason “True”. The point I’m trying to make in drawing out this implication is that you need reason, to some extent, in order to coherently and possibly believe in anything at all. Without reason it is impossible to believe in anything in the usual manner; you cannot have any beliefs whatsoever. It would impossible to sustain a coherent worldview or perspective about the world. You don’t just believe in things, but when you do believe in things you are unconsciously using the principles of logic which derive from Reason itself. You use the basic resources from Reason to make believing possible. If there are believers who sincerely think that “Reason is a whore” or “Bride of the Devil” (Which Martin Luther said) or “Reason just isn’t relevant in the matters of faith” or “do not leaning in your own understanding”, then they should think again: If Reason is bad then the principles of logic that derive from reason are bad, but if they are bad then anything you believe in must be bad as well. If you should not lean to your own understanding (which I assume is synonymous with reason) in the most basic sense, then believing is impossible. It is precisely because you do lean to your understanding in the most basic level that believing is possible! The irony here is that faith is not opposite to reason; rather faith is subordinate to reason in order for it to be possible at all because it is impossible, without the principles of logic, to believe in anything! What faith essentially boils down to is this: “I secretly use the principles of logic that derive from reason to make believing possible, but I publicly exclude reason from religious matters” That’s a serious hypocrisy and double standard there. However faith can also boil down to this “I depend on reason at minimum to make believing possible but I do not justify what I believe”. Faith in that sense is essentially slothful reason; it is reason at its laziest. An optimal use of reason is using logic as well as finding evidence or making arguments. But if you just limit yourself to just the principles of logic then you can believe in anything but that won’t make any of them true. Now there are some objections that I have considered and I want to respond to them. But I will first go over these possibly fatal objections. The first objection is that in reality we have faith in reason to make it possible rather than having reason in order to have faith. The second objection is the Presuppositionalist view that everything, including the principle of logic, assumes the existence of God or require the existence of God for these things to be sensible. The first objection which says that we need to have faith in reason to make it possible rather than to have reason to make faith possible argues that we cannot justify reason. We cannot prove that reason is reliable because we do not have any proof to show it so. Instead of proving reason we take it for granted just by believing in it. We simply have faith in our reason. This objection is the skeptical objection to reason. The second objection is the Presuppositionalist view that everything from Logic to Mathematics assumes the existence of God to make them understandable. Without the existence of God none of these things that we study in our schools would make sense. If that be the case then the principles of Logic ultimately derives from God to make any belief possible. However here is my response to both objections respectively: The first objection misunderstands the burden of proof. The burden of proof applies when there is a statement that is initially unjustified and counterfactual. To say that “Reason is unreliable” is a counterfactual claim and an unjustified claim as opposed to “Reason is fallible but reasonably reliable”. So the burden of proof applies to the skeptics of reason. But if this objection is not strong enough let’s say that I grant them the proposition that “Reason is unreliable” or “We cannot justify Reason”. But how the hell did I grant them the proposition if Reason is unreliable? How can the skeptics of reason use propositions, the very things that depend on the principles of Logic? If the Skeptics did show that the proposition “Reason is unreliable” is true, they are using the principles of logic to defeat reason, but this is absurd! How can the principles of logic make the proposition “Reason is unreliable” a true proposition? If “Reason is unreliable” is a true proposition then the principles of Logic cannot reliably make it possible for that proposition to be a true proposition (after all, reason is unreliable). But it the principles of Logic cannot reliably make it possible for the proposition “reason is unreliable” to be a true proposition, then it follows that we would not be certain of the truth-value of the proposition “reason is unreliable”. It is a self-defeating proposition. If I did prove that “reason is unreliable” to be true I am also proving that reason is reliable! Otherwise how did I prove that proposition is reason is not reliable? Furthermore, If I really have to have faith in reason wouldn’t that be self-defeating? Faith is essentially a logical fallacy of appeal to ignorance, but one of the things about Reason is it avoids logical fallacies. Why should we use a logical fallacy to believe in that which avoids logical fallacies? Wouldn’t appeal to ignorance violate Reason? To say that “We should have faith in reason” sounds like saying “We should resort to the logical fallacy of ignorance to believe in something that tells us that logical fallacy is a bad reason to believe in anything”, that sounds incoherent. So it is not possible to have faith in reason. The second objection has its own problems that I would like to point out. First, which God does Logic assume? Judea-Christian God Yahweh? Allah? Brahma? Mithra? Zeus? Or the deistic God? Which one of them really? What reason do we have to choose one of them? Wouldn’t it be arbitrary? Also, it isn’t clear whether logic needs to assume the existence of God in order for it to be possible. If it did then the proposition “God does not exist” could not possibly be generated by Logic. If God himself cease to exist, we would still be able to use Logic to evaluate the statement “God does not exist” to be a true statement or “God does exist” to be a false statement. Logic is necessarily independent of the existence of God. Same with mathematics: if God did not exist, it would make sense to say “There is zero God”. The conclusion I want to make from all of this is that reason is very important in our daily lives. It is indispensable in any worldviews, ideology, and belief system. Its basic principles of logic are so universal that without it believing wouldn’t even be possible. Sure, Reason would not always make us happy but that’s because that’s not Reason’s primary function. It’s like blaming the school janitor for not tutoring you. Reason’s Job is not to make us happy but to give basic guidelines or rules that make believing possible, as well as justifying them. However, in a very strange and indirect way Reason can make us happy and unhappy: If believing in something makes you happy then you should be grateful to Reason since it made that believing possible. If believing in something makes you miserable, then that’s just one of the accidental consequences of depending on Reason. Of course, there is more to Reason than meets the eye such as making long term plans, creating strategies, abstract analysis, regulating emotions, focusing, and making decisions. These things (as well as emotions) make us very much human; it’s what separates us (at least in degrees) from the rest of the animals (Aristotle did say that humans are rational animals). I’m not saying Reason will solve everything or it would make our reality into a utopia; These are common accusations that religious conservatives might make on secular progressives who value the progress of science. But we do need reason to be able to believe, to examine our beliefs, and to justify our beliefs the best way possible.